Orion Broadband are an Irish owned company, established in 2008 specializing in Wireless Broadband. Their aim is to “provide both residential and business customers with reliable, affordable, high speed wireless broadband“. 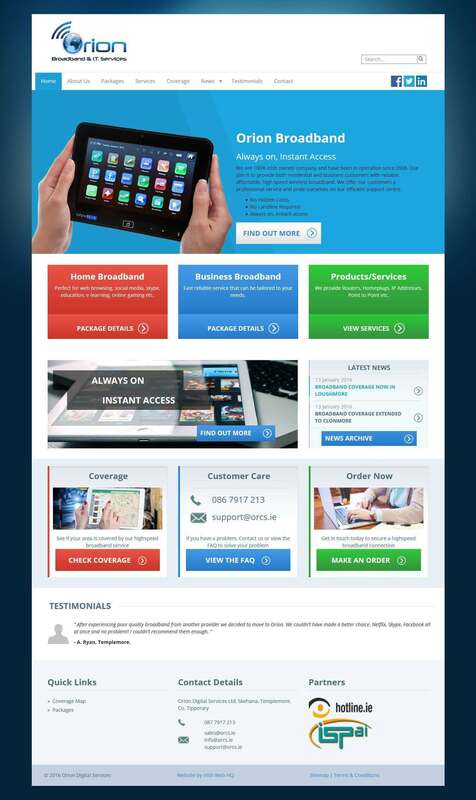 The design we developed for Orion broadband can be seen in the Figure below. Like all of our sites at Irish Web HQ, Orion is using one of the most popular mobile-first front-end frameworks known as Bootstrap. One of the most important features of Bootstrap is its grid system. Like any grid system, there’s a collection of rows & columns which makes the placement of content much easier. Orion’s design is aesthetically pleasing and well visually balanced via Bootstraps Grid System. Bootstraps grid system allows up to 12 columns per row. Row classes must be placed within container classes and only columns may be immediate children of rows. For example, the first three features of Orion Broadband, “Home Broadband“, “Business Broadband“, & “Products/Services” are are each in a column of size 4 which together adds up to 12 as shown in the code below. Like most of our clients, most want to bring the users attention to latest Blogs/Posts they have published once they first visit the site as of course regular blog posts drive in traffic. Orion now have a latest news section where they keep their customers/potential customers informed of the progress of Orion Wireless Broadband Coverage. Adding these blog posts have never been easier, Orion can add a new post in two clicks. Literally!